Search marketing done right lands your site the first listing on Google or Bing results, but the consequences of search done wrong are much, much worse: In January 2016, the founder of a search agency in Texas was sentenced to 37 months in federal prison for his shady practices. This fraudster’s company used deceptive tactics to affect the search engine rankings of his clients by creating fake reviews, fictitious websites, and manipulating hidden text on websites—without his clients’ knowledge. I’ve been in the industry for 15 years, so I know it’s not easy to manage all the moving parts of a search strategy. When a company starts looking for a partner to drive their search marketing efforts, it can be tough to tell who just talks the talk and who really knows their stuff. As the above story illustrates, not everyone can promote your site without resorting to criminal activity. In order to ensure that your search marketing partners are knowledgeable, ethical, and have your goals in mind, make sure to ask these four questions before signing a contract with an agency or expert. 1. How Do You Stay Up-to-Date on Best Practices? The search industry changes quickly. The technologies we rely on (search engines like Google and Bing) have their own objectives that don’t always align with businesses. Even a small change in how Google works can make your prior approach totally ineffective. When working with a search expert, be sure to get a sense of how current their expertise is. You don’t want to find yourself working with last year’s best practices. Two key signs to look out for are article length and keywords. A few years ago, search engines favored shorter articles in the 300-word range. Today longer pieces around 1,500-words are a much stronger choice. Search engines have also gotten much better at determining the quality and context of content, making keywords less impactful. Before, an article would need to use a keyword several times to make an impact. Now search engines will be looking for related words, not the exact same phrase. Make sure your strategy is based on the most up-to-date insight, and find a professional who knows where to look to stay ahead of the curve. 2. When Was the Last Time You Changed Your Approach to SEO and SEM? Search marketing is a moving target, making it harder to continue your success through change. But it also presents an opportunity to be an early adopter and create an agile strategy. Make sure you’re working with a search marketing professional who is nimble enough to pivot based on constant change. The pace of change can also make you vulnerable. Educating yourself can protect you from so-called experts who are less than honest. Attending digital marketing conferences like SearchFest, seeking out industry resources, and following search marketing news can help you spot an “expert” who is anything but. 3. What’s the Best Way to Utilize the Power of Mobile? If your company has a mobile app, make sure it’s designed for search, too. If your content appears differently for mobile than for desktop visitors, make sure that change doesn’t impact how Google can interpret your content. 4. What’s the Most Important Consideration When Setting Search Strategy? Pay close attention to how your search expert answers this question, and have an answer of your own in mind. Look for an answer that focuses on intention and engagement rather than huge, crazy numbers or specific tactics. It’s not just about rankings or clicks—it’s about what the visitor does after the click. Good search marketing strategy considers how people actually behave once they reach your website: How long are they spending there? What do they click on next? What actions do you see from visitors? For example, do they make a purchase, sign up for your email newsletter, or become a Twitter follower? Setting goals up front helps keep expectations above board and prevents the temptation to chase the big, empty numbers. The next time you’re looking to build your business through SEO or paid search, bring these questions to your meeting with any potential experts. You want to work with someone who is up-to-date on where the industry stands, sets strategy that favors action over flashy numbers, and aligns with your company’s goals and ethics. 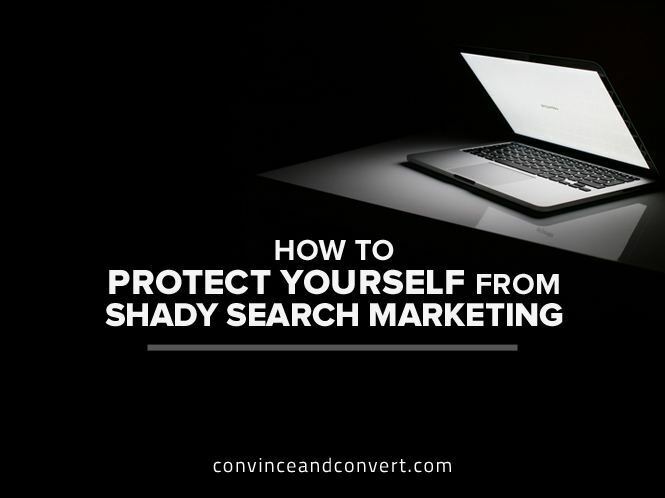 By having these conversations up front, you’re creating a strong foundation for long-term search success—and protecting yourself against “experts” that are out-of-date, misinformed, or even criminal.